Are you ready for Spider-Man 2.0? It’s been only five years since “Spider-Man 3,” but Hollywood is already hitting the reset button with “The Amazing Spider-Man,” swinging into theaters July 3. New stars. New director. New origin? Entertainment Editor Mark Meszoros (@NHFeatures), Sports Editor and superhero nut Mark Podolski (@MPodo) and Chris Lambert, who writes the News-Herald Community Media Lab blog Comics: Don’t Get Me Started, talk the movie and Spidey’s legacy in the world of comic books. 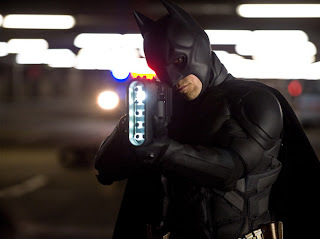 As excited as I am for "The Dark Knight Rises" (remember Christian Bale's rant on the set of Terminator: Salvation years ago? That's me, but in a good way), my geeky heart belongs to Spider-Man. I know it sounds corny, but hear me out. When I was a kid, Batman was the superhero I wanted to be, but I knew Spider-Man was the superhero that suited me best, if that makes sense. When Spider-Man entered my world, I was a shy, geeky 7-year-old in grade school, just like Peter Parker, albeit an older version. When he put the mask on, showed off his mega-cool web shooters and crawled up walls ... well, that's when the dreaming began. For a 7-year-old, there wasn't anything as cool, and I wasn't the only one. We're approaching the 50th anniversary of Spider-Man's first comic book appearance. In August 1962, Spider-Man appeared in Amazing Fantasy #15. Since then, he's been a pop culture sensation with no end in sight. On July 4, "The Amazing Spider-Man" hits the big screen, only this time Tobey Maguire is out as Peter Parker, and Andrew Garfield is in. Many are saying this reboot is too quick, but I'll subscribe to the theory Spider-Man always sells. As bad as Spider-Man 3 was, it still made big bucks, but a change was needed. Trailer buzz for the film has been building, mostly because the reboot appears to be heading back to the franchise's roots when Spidey first appeared in '62. That's a good thing. Co-creators Stan Lee (writer-editor) and Steve Ditko (writer-artist) conjured up a masterpiece of imagination. Years later (35 to be exact), Spider-Man is still stuck to me like his webbing. The obsession isn't there like it was as kid, but similar to the first time you learned to ride a bike, or those late summer nights playing kick the can with childhood friends, early memories of happiness never leave you. When a lot of things in the world didn't make sense to me as a child, Spider-Man made perfect sense. It's that simple. Strangely, we might have never seen or heard of Spider-Man had his creators not taken a chance in the early 60s. Before Spider-Man, teen-agers in superhero comic books were usually relegated to the role of sidekick. Lee and Ditko broke new ground by making Parker a teen-age high school bookworm, but it was more than that. Parker's fear of rejection, inadequacy and loneliness made him a fragile hero. Most comic book publishers wouldn't dare go that route with a super hero, especially in the '60s for fear of poor sales. In Lee and Ditko's case, the creation of Spider-Man was more about timing. 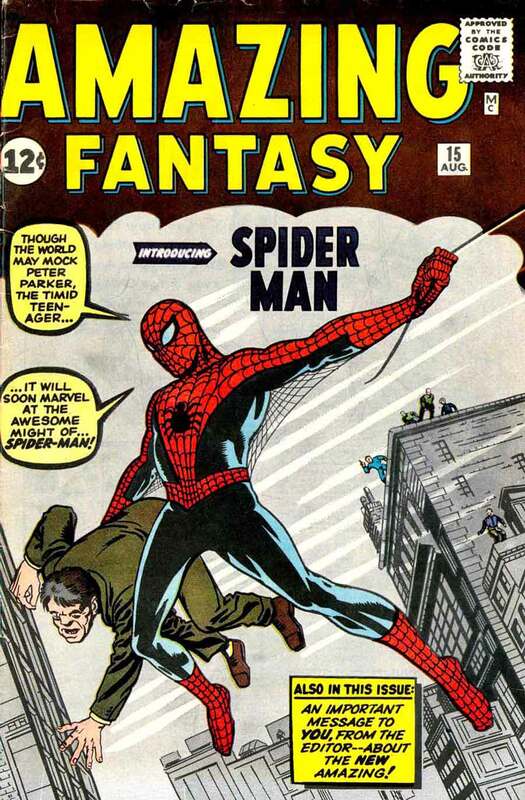 According to reports, the publisher of Marvel Comics at the time agreed to try out Spider-Man in the final issue of the canceled Amazing Adult Fantasy, renamed Amazing Fantasy for that August 1962 issue. The thought was if Spider-Man tanked among readers, it would likely be gone forever with the cancellation of Amazing Fantasy. It didn't happen. A few months after the web-slinger's introduction, the issue was reportedly one of Marvel's highest-selling comics. In March 1963, The Amazing Spider-Man #1 hit newsstands and the series became Marvel's top-seller. Just as quick, Spider-Man became a pop culture icon. In 1965, an Esquire magazine poll of college students ranked Spider-Man as one of their favorite revolutionary icons, along with Bob Dylan. Asked why, one interviewee reportedly picked Spider-Man because he was "beset by woes, money problems, and the question of existence. In short, he was one of us." Spider-Man is also one of us in another way: He makes mistakes. The biggest occurred in what has to be one of the best origin stories in the history of superheroes. It's a brilliant tale that would have worked well in one of Rod Sterling's Twilight Zone series. After Parker is bitten by a radioactive spider and is bestowed his powers, he dons his Spider-Man costume, is instantly a novelty TV celebrity, and in the process becomes full of himself. When he ignores a fleeing thief he could have easily stopped, that same thief later shoots and kills his uncle Ben. Only after capturing the thief does Spider-Man realize that, "With great power comes great responsibility." That was a lot to grasp at the time for a 7-year-old. Heavy stuff for sure, but Spider-Man's origin story and his '60s comics have resonated with me for years. Here's hoping we see some of that old Spidey nostalgia in the latest big screen version - almost 50 years to the date. I'm disappointed to see Wes Anderson's "Moonrise Kingdom" fall out of the top 10. I saw it this weekend at Cedar Lee and thoroughly enjoyed it. 10. “Seeking a Friend for the End of the World,” $3.8 million. a winner or loser depends on you and "The Dark Knight Rises." No, the calendar says it's not actually summer yet. And yet we're probably about halfway into what we consider the summer movie season. So far, the summer's been .... good. Not great, but by no means bad. As you would hope, "Marvel's The Avengers" and "Prometheus" -- in which director Ridley Scott ventures back to his "Alien" universe -- have been the best of the bunch. Neither movie was everything I hoped it would be, but each is entertaining enough to get a solid recommendation. I gave the same rating -- three stars out of four -- to "Battleship," easily the pleasant surprise of the season. A summer needs that really fun bad movie," and "Battleship" was this summer's. My disappoints so far have come in "Snow White and the Huntsman" and "Rock of Ages." I expected neither to be outstanding, but I thought each had a lot more potential than it showed. If "Rises" is anywhere near as good as its predecessor -- I gave "The Dark Knight" four stars -- and brings director Christopher Nolan's trilogy to a satisfying end, consider the summer a smashing success. A big thanks to Michael Slezak at TVLine, who compiled the 10 best sketches from this season of "Saturday Night Live." Overall I don't find the show too funny anymore, so I'd much prefer to catch up on the hilarious moments this way. Bummed to see that Michael Buble's "Christmas Duets" sketch didn't make Slezak's list. I'm still laughing at it six months later. I'm not saying that "Rock of Ages" and "That's My Boy" are bad movies, but it's certainly not a good sign when new movies with big buzz are beat by those already in theaters. 9. “Moonrise Kingdom,” $2.18 million ($700,000 international). With the 40th anniversary of the Watergate burglary on June 17, many people have written about how the ensuing investigation and how it was covered would have been different today. This includes Twitter, which Washington Post reporters Bob Woodward and Carl Bernstein, authors of "All the President's Men," didn't have access to in 1972. The reality show premiered its second season June 5 and airs Tuesdays at 10 p.m. on Oxygen. Last year, two winners — Damian McGinty and Samuel Larsen — were awarded seven-episode arcs, and two “Project” runners-up — Lindsay Pearce and Alex Newell — were given two-episode arcs. Fan-favorite McGinty was cast as Rory Flanagan, an Irish foreign exchange student. Mr. Smoldering Eyes (a.k.a. Larsen) was cast as dreadlocked, “God Squad” member Joe Hart. Pearce was given the role of Rachel Berry (Lea Michele) foil Harmony. Newell made a memorable appearance as rival choir member Wade Adams, who performed in drag as Unique at the all-important nationals. This year, Murphy started out the season by announcing only one winner would be selected from among the 14 finalists. The show repeats the basic format of its first season. Each show has a theme and is crafted around that. They get assigned a “homework assignment,” a song that they learn and practice then perform in front of a mystery guest judge from the cast of “Glee.” The guest judge picks a winner who gets a one-on-one mentoring session and a featured role in the group performance music video that the contestants create. They practice choreography with “Glee” choreographer Zach Woodlee and vocals with Nikki Anders. Next they shoot a video with music video director Erik White. Their performances in the video and are set are used the primary criteria for who gets a callback. At callbacks, the bottom three are revealed. Those three then do individual performances before Ryan Murphy to try to convince him to keep them on the show. Final callbacks, entail a final casting list and a mournful appearance by “Glee” casting director Robert Ulrich telling the bottom three “the list is up.” The eliminated contestants then sing the lead vocals on Avril Lavigne’s “Keep Holding On” during the usual I’m-leaving-a-reality-show spiel of goodbyes, reflections on their time on the show, and speech about how it wasn’t there time to leave yet. I’m pretty down with all that coming back with the exception of “Keep Holding On.” I was hoping they’d come up with something fresh this year, but hey it’s a shtick and they’re keeping it. I’m glad to see mentors Nikki, Zach and Robert return. They’re likeable, make frank assessments of the contestants, and seem like they’re genuinely trying to help the contenders to do their best. Frankly, other than watching the contenders rise and fall, the best parts of the show for me is listening to their comments about the contestants and the often harsh and to-the-point evaluations by Ryan Murphy. The guest judges brought different insight to “The Glee Project” last season, and this year probably will be similar. The first guest judge was Lea Michele. When she stepped into the choir room, I thought some of the contestants were going to cry or faint. Frankly, Lea looked a bit terrified by the over-the-top reactions. And then there’s the contestants. They were introduced in a casting special where a huge field of contenders was narrowed down to 14 (on the outset it was supposed to be 12 but Ryan Murphy liked 14, so it was 14), seven girls and seven boys looking for their big break. There’s way too many to talk about right now but I’ll give some basic details on my favorites. Mario Bonds, 24, who’s blind and confident about his talents. Charlie Lubeck, 22, who’s rocking severe ADHD and a mild autistism spectrum disorder. Aylin Bayramoglu, 19, a spitfire Turkish Muslim who’s a total flirt. Ali Stoker, 24, a bubbly blonde who happens to be in a wheelchair. I could do without some of the contestants (the Justin Bieber look-alike girl for one), but it’s a little too early to really tell if any of the contestants will be able to hack it. The big drawback of these early shows is that there are so many contestants that many of the contenders only get a line or two in each song and a few moments of screen time in the video. I am very excited to catch tonight’s Danceability episode, though the previews online website are giving away a ton. You can even check out the entire music video performance. This week it’s LMFAO’s “Party Rock Anthem,” and it’s definitely showing a different side of the contenders. Though my high school years never involved spin the bottle, I'm sure I'll find something to relate to in tonight's episode. I always do. Catch the Final 14 casting special on Hulu here. Check out the first episode on Hulu or on Oxygen’s website. If you're into the show I'd also recommend checking out its YouTube channel for behind-the-scenes stuff, interviews, previews, and more. Let me know what you think of this week’s developments by email or Twitter. Just please no spoilers on who goes home. My work schedule here at The News-Herald keeps me from watching the show until Wednesday. I'll tweet about the show as I watch it all season long. Are you on Twitter? Follow the list 2012 Tony Awards. The family-friendly third installment in the "Madagascar" movie franchise took first place this weekend ahead of the prequel-not-prequel to "Alien," "Prometheus." What did you see this weekend? 10. "Moonrise Kingdom," $1.6 million. The day after the of the season finale of "Game of Thrones" has become one of the saddest of the year. As I did last year on this dark day, I'm wondering how I'll possibly survive without HBO's epic fantasy drama series for another nine or 10 months. Seriously, it took FOREVER for the second season arrived April 1 after the first ended on June 20. While I can't argue that it's the best drama on TV -- an honor that belongs to one of two AMC shows, "Breaking Bad" or "Mad Men" -- it is my favorite. HBO's adaptation of author George R.R. Martin's "A Song of Ice and Fire" novels is spectacular and addictive. Much as last year's finale did, Sunday night's "Valar Morghulis" seemed as interested in setting up future story lines as it did in wrapping up current ones. Much should be different for the newly married "King of the North" Robb Stark (Richard Madden); the no-longer-soon-to-marry Sansa Stark (Sophie Turner); her suddenly free and mobile sister, Arya (Maisie Williams); the yanked-from-power, fan-favorite drawf Tyrion Lannister (Peter Dinklage); the further disgraced Theon Greyjoy (Alfie Allen); and the increasingly powerful "Mother of Dragons" Daenerys Targaryen, who's babies showed the ability to generate some fire. 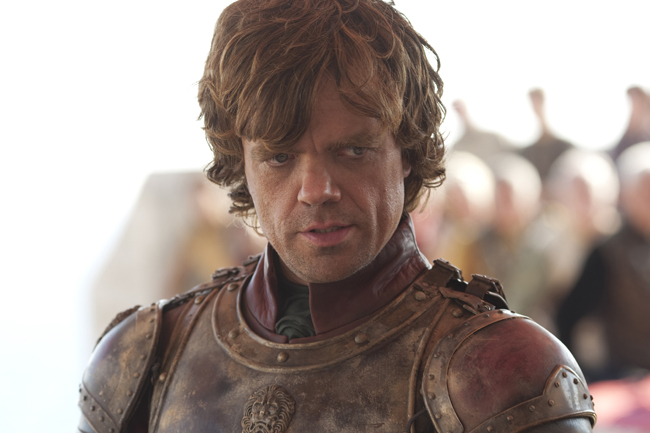 of the just-concluded second season of HBO's "Game of Thrones,"
it had to be "the imp," Tyrion Lannister (Peter Dinklage). Other things haven't changed, King Joffrey Baratheon (Jack Gleeson) is still a little ... jerk. (Yeah, let's go with jerk.) And his mother, CerseiLannister (Lena Headey), continues to wield power behind him. I could go on and on; there are lots of players in this game of thrones and nearly as many story lines. Even if it isn't quite as good as it was, "Game of Thrones" is still better than almost everything else. Well, it can't come soon enough. With another season of "Mad Men" -- a terrific season, at that -- about to end, I will eagerly await the beginning of the final two-part season of "Breaking Bad" on July 15. But ultimately I simply must wait. I know how this game is played. Other than "The Avengers," which I saw twice (I have a soft spot for superheroes), I haven't seen any of the top 10 this week. In fact, I haven't even heard of two of the films that made the list ("The Best Exotic Marigold Hotel" and "For Greater Glory"). I might make it out to see "Snow White & the Huntsman" or "Men in Black 3" but the rest of these probably won't draw my money. 1. “Snow White & the Huntsman,” $56.3 million ($39.3 million international). 2. “Men in Black 3,” $29.3 million ($78.6 million international). 3. “The Avengers,” $20.3 million ($12.4 million). 4. “Battleship,” $4.8 million ($1.5 million international). 5. “The Dictator,” $4.7 million ($6.5 million international). 6. “The Best Exotic Marigold Hotel,” $4.6 million ($557,000 international). 7. “What to Expect When You’re Expecting,” $4.4 million ($3.7 million international). 8. “Dark Shadows,” $3.9 million ($7.2 million international). 9. “Chernobyl Diaries,” $3 million. 10. “For Greater Glory,” $1.8 million.